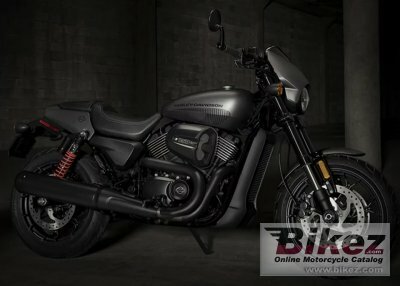 2018 Harley-Davidson Street Rod Dark Custom. Picture credits - Harley-Davidson. Submit more pictures. Every inch of the motorcycle has been thought through to meet the demands of navigating the urban landscape. The Street Rod� features a new High-Output Revolution X� engine that will rocket you from stoplight to redline at 9000 rpm. New 43mm inverted front forks and piggyback reservoir rear shocks let you carve through clogged streets with ease. You get a pure, stripped down, aggressive look. Price as new (MSRP): US$ 8465. Euro 8699. Prices depend on country, taxes, accessories, etc. Ask questions Join the 18 Harley-Davidson Street Rod Dark Custom discussion group or the general Harley-Davidson discussion group. Bikez has discussion forums for every bike. View comments, questions and answers at the 2018 Harley-Davidson Street Rod Dark Custom discussion group. You can sign up for e-mail notifications when other riders answer you. If you have extensive experience with the MC, please send us a review. If you consider buying this bike, you should view the list of related motorbikes Look at photos. Compare technical specs. And check out the rating of the bike's engine performance, reliability, repair costs, etc. You can compare the rating with other bikes.